She and Mark, with a group of their closest friends, were attending a charity auction when Cassie’s world as she knows it takes a shocking turn. Her husband and her best friend Tina, have been having an affair for the past two years. It was announced in spectacular style to the whole room by Tina’s inebriated husband. Cassie gets through the next few weeks with difficulty, not made any easier by the fact she is asked to fill in as head teacher, starting immediately. There’s also a development company planning to build a housing estate on the green belt around the village, which includes her grandfather’s wildflower meadow. Making a bad situation worse, they also want to demolish Little Acorns. Cassie is a very likeable and sympathetic character and I love how she manages to turn her life around after the huge shock of her husband’s affair and at the same time being thrust into the role of a single parent. Luckily she has excellent support in the form of friends and family. The new job and the fight against the development help to keep her mind off her personal problems. I think I was fooled somewhat by the cover. 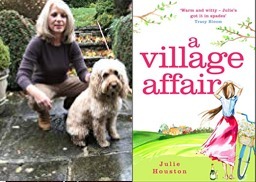 I hadn’t read Julie Houston before otherwise I probably would have known better, because A Village Affair wasn’t at all what I was expecting (and I mean that in a good way.) Although the narrative is full of humour, which balances out the heartache and drama, serious and more sensitive subjects are handled delicately and are interspersed with wonderful and sometimes hilarious illustrations of life in a primary school. A very well written, real and easy to relate to story with memorable, well defined characters. I particularly enjoyed Cassie’s free spirited and unconventional mother. The unpredictability of life makes Cassie re-evaluate who she is and what she wants and, more importantly, what she doesn’t want. With some great twists the pace is steady but never slow. A really lovely read. I’ll definitely be reading more of Julie Houston’s books. I chose to read and review A Village Affair for Rosie Amber’s book review team, based on a digital copy from the author. What an awful way to find out about an affair, Cathy. Lovely review. This sounds like a very interesting read. Wonderful review, Cathy! Thanks, Chrissi 🙂 I really enjoyed it. This sounds like a good read. Your review convinced me to add it to my TBR. I love the cover. Ooh, good! I hope you enjoy 🙂 I love the cover too.